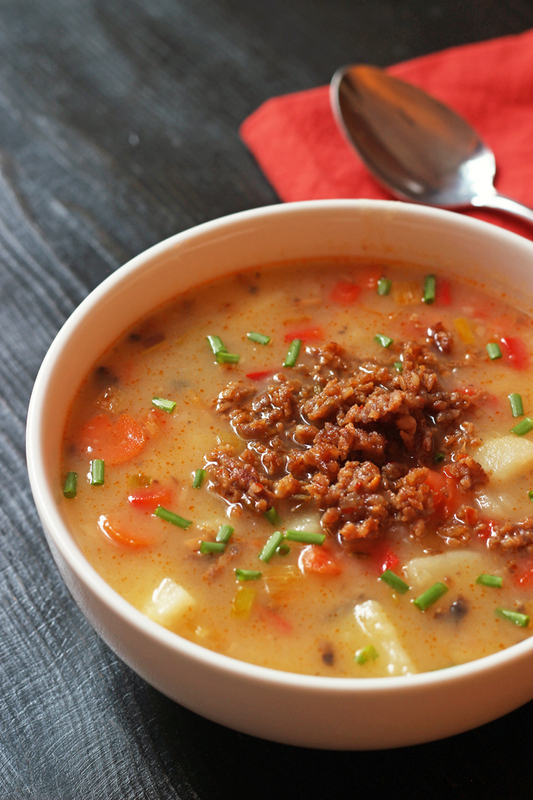 Cozy up with a bowl of this Sausage Potato Soup. Chock full of potatoes and other vegetables and a spicy Italian Sausage, this soup is delicious comfort food. Last week we had a rainy day — and it was so exciting. That’s what years of drought will do for you. You go outside in your pajamas and barefeet and let your kids ignore school to splash in puddles. Kinda like that Ray Bradbury short story we had to read in high school — only reversed. If we’re gonna have that rain, we are going to enjoy it. We had our one day of fall, and now it’s back to hot weather again. But, they keep saying El Nino is coming. I wish that bad boy would hurry up already. I’ve got this yummy Sausage Potato Soup Recipe to greet him. My family loves this soup. And I must love them seeing as I’ve made many times in a hot sweaty kitchen over the last few months. I really should start making a double batch. There have rarely been leftovers. When your teenage son talks about Sausage Potato Soup the following day, you know it’s a keeper. Typically potato soups are chock full of dairy and focused on potatoes. I went in a different direction this time, adding a variety of vegetables (carrots, peppers, leeks) and some spicy sausage. Feel free to use regular onion if that’s what you have or typically buy, but if you get a good deal on leeks, grab them. They are delicious! I think the small amount of hot Italian sausage gives you a good amount of heat, but my eldest likes to add red pepper flakes to turn things up a notch. You can leave out the sherry if that’s not something you buy, but it does bring another layer of flavor to the soup. This soup is a meal in itself. All you need is a nicely-filled bread basket for dinner to be set. Oh and a rainy day wouldn’t hurt. In a large heavy pot over medium heat, cook the sausage until no pink remains, breaking the pieces up with the back of the spoon. With a slotted spoon, remove the meat to a bowl and cover. Add the olive oil to the dripping in the pot and heat to shimmering. Add the leeks, carrot, and mushrooms, and cook for 5 minutes. Add the peppers and cook 1 minute more, stirring. Remove the vegetables to the bowl with the sausage. Deglaze the hot pot by adding the sherry to the pot and scraping up any browned bits. Add the potatoes and chicken broth to the pot and bring to a simmer. Cook for 20 minutes, or until the potatoes are tender. Mash slightly with a potato masher or use an immersion blender to break up the bits. Add the vegetables and sausage back to the pan. Cook 5 minutes more. Serve hot with fresh chives, if you wish. oh boy does this look yummy! And my vegetable averse son might love it, given the spicy sausage angle. Definitely going to give this one a whirl this Fall! I sure hope El Nino comes and gives you guys tons and tons of rain. I spent three weeks in Del Mar in July-August, and it was just so sad (the trip wasn’t but the water situation sure was). So very desperately needed. Praying from DC that this el nino is at least as good if not better than they’re predicting. This looks so good! I have everything but the sausage. I’ll have to pick up some next week and give it a whirl when the weather cools down to the 80’s. This week it is upper 90’s low 100’s. Be gone summer! Oh my goodness! This soup looks so good, I could almost taste it through the computer! 🙂 We love, love, love soup and I am really looking forward to the cool days of Fall with the leaves flying all over the neighborhood and the house filled with the aroma of a good, hot soup. Halloween is my soup opener season. When my girls were little and we used to take them out trick or treating, I always made a big pot of meatball tortellini soup that morning and it was always so good after being out in the cold for hours with them. It warmed us all up. Now that they’re grown, I’m still making that soup not because we’re cold from trick or treating but because we’re cold from sitting in the driveway dressed up as zombies giving out treats. 🙂 And also because at this point, it just wouldn’t feel like Halloween without that soup. This is a soup that I will most definitely try and look forward to seeing and smelling it in my own kitchen! This sounds so good! I’ll have to pick up the ingredients. I’m going to have to try this. I have added celery and occasionally carrots to potato soup, but never mushrooms and it sounds yummy. Unlike your eldest, my husband doesn’t like much heat in his food. If you were trying to reduce the heat would you use mild Italian or regular breakfast sausage? I’m looking forward to soup weather, although I have made it occasionally already, especially on rainy days. Hope you get lots of needed rain. The drought is better now here in the middle of the country, but I know that isn’t true elsewhere and I’m an old country kid who knows the pain of a drought. Bless you for all you share and provide for us. Absolutely. Just use whatever sausage he prefers. You could use bacon instead, too. Where do you buy bulk italian sausage? Sprouts? Love the new book!! Johnsonville sells it, but you can also buy it at Sprouts. Oh this looks good! I’m in Calgary, Alberta, Canada, and as much as most don’t want summer to end, I’m ready for fall, which we’re getting a little bit. And soup is one reason why! This looks yummy. Do you know how it would freeze? I’ve had good luck with freezing potato-based soups and other things, but there was usually dairy in it. Would love to have this in the freezer. Thanks for this recipe! If you used red potatoes, it should freeze “okay”. Other kinds of potatoes can get mealy during freezing. Happy fall! That soup does look like a keeper. I love chunky soups with lots of veggies in them. It’s love in a bowl. This looks delicious! I’m putting it on the menu plan for next week. 🙂 One question, does this take cooking sherry or regular sherry, the kind you would drink? I assume cooking sherry but I’m not very familiar with using sherry so I wanted to check. Thanks! Made this tonight. It’s excellent! I actually made this soup, and it was delicious. But the 8 cups of potatoes made it almost a solid mass. Could that be a typo? Thanks for an otherwise delicious recipe. I use this 2 qt measure filled with cubed potatoes. (affiliate link there) I’ve used yellow as well as russet in the recipe and made it several times. There’s always been quite a bit of broth, so nothing like a solid mass. What kind of potato did you use and how did you measure it. I used Yukon Gold potatoes, a yellow fleshed variety. I measured 2 times a Pyrex 4 cup measure. I much prefer using the weight of ingredients. Still a very good soup. I too wondered about the amount of potatoes. I also find that it takes a lot of broth if using a lot of potatoes. I have ruined so many soups by adding even just a little amount too much of potatoes. I was also going to cut the amount way back just to be safe. But can’t wait to try this. I also am going to add some cream to enrich it. We love cream added to soups. You know, I’m thinking it must be the size of the potatoes. Mine are about 1-inch cubes. The weather has finally gotten cool(er) here, so we’ll be trying this recipe this week. It looks great, and I love the rave reviews! Made this tonight and also ran into thickness problems even though I only used 6 cups of potatoes. It seemed okay when the potatoes were cooking, but once I whizzed them with the immersion blender, it got super duper thick. I added almost 2 cups of liquid to get it more soup-like. In your photo, it looks like you left it more chunky so I’m thinking that is where the difference is. If you just smash the potatoes a bit or blend up a few for creaminess factor rather than pureeing all of them, it’s probably a much better consistency. Upon re-reading the directions for the 8th time or so, I’m guessing that is what you were actually telling us to do and “immersion blender to break up the bits” doesn’t actually mean to puree the whole pot like I did. I made this tonight and made adjustments made on comments. It turned out unbelievable. The cook time for the potatoes were way off. Used 3 lg potatoes cubed. Used my beater to break up before adding all the vegetables. Used 1lb of jimmy dean hot sausage and 3 cans of chicken broth. Other than that, followed the recipe. It was a great hit. No one could believe their were no spices added. Will definitely make again!! I haven’t, but I think it would be great! Chop coarsely and add near the end?